Boatersland Marine > Outdoor Products > RV Products > RV Awnings > RV Awning Mats > Mings Mark RA3-BLU/BEIGE 9X12 Patiomat Blu/Beige Clas. 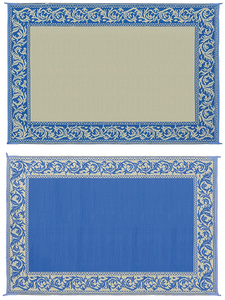 Mings Mark RA3-BLU/BEIGE 9X12 Patiomat Blu/Beige Clas. Reversible mats can be used for your RV patio, in the garden, on the beach perfect for placing under pets exercise pens and cages; picnic and various indoor and outdoor spaces.